Add a little zen to your workspace with the Bamboo Desk Organizer Set by UPLIFT Desk. Enjoy an 8 piece matching desk set made out of genuine bamboo that helps you keep your desk clean. When you have spare paper, notes, and the like, this set gives you homes for all of your spare desktop decor. Store documents, mail, and memos in the trio of boxes, which sit on top of each other like beautiful, minimalist desk hilltops that double as stylish storage spaces. A blue ballpoint pen with matching pen holder let you jot down last-minute ideas with class. Keep your loved ones close in the 4" x 6" picture frame, give your business cards the room they deserve with the business card holder, and keep your phone within easy view on your desk with the phone holder. Enjoy a coordinated desk look with the Bamboo Desk Organizer Set. 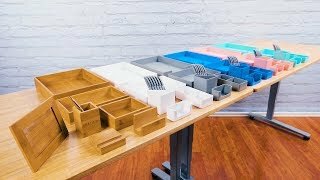 UPLIFT Desk designed the Bamboo Desk Organizer Set to give users storage space for their most frequently used desk items. The set comes complete with a large box, a medium box, and a small box. These let you hold 8.5" x 11" paper (large box), mail (medium box), and memos (small box) easily and stylishly. You'll also get a business card holder, a phone holder, a pen holder, and a ballpoint pen with blue ink. The kit is completed with a 4" x 6" picture frame. How is this organizer set eco-friendly? We love bamboo because it's a very sustainable material that regenerates quicker than grass, and in some parts of the world, it is considered grass! The Bamboo Desk Organizer Set is made of real and genuine bamboo that's harvested from eco-friendly sources to provide users a beautiful desk set that's as good for them as it is for the environment. How do these boxes fit together? You'll love the look of bamboo on your desk when you stack the large, medium, and small box on top of each other. Although boxes can be stacked and do not nest, stacking might not be stable depending on the contents and weights in the boxes.